Nagpur, June 6 : Rashtriya Swayamsevak Sangh (RSS) Sarsanghchalak Dr Mohan Bhagwat Thurday madea strong case for restoring Dharma that is value system that holds society together to put the fast declining social, political and economic situation back on rails once again. Dr Bhagwat was addressing the concluding function of the on-going Third Year RSS Sangh Shiksha Varg at Nagpur wherein swayamsevaks from all over the country participated at Reshambag grounds. Sri Sri Sri Nirmalanandnath Mahaswami, head priest of Chunchungiri Mutt, Bangalore, was the chief guest while scion of Baroda Maharaja Samarjitsinh Gaekwad graces the occasion with his special presence. Sarvadhikari of the camp Sri Pawan Jindal and Nagpur Mahanagar Sanghchalak Dr Dilip Gupta were also present on the dais. The RSS Chief reiterated that the rulers were bound to uphold the Dharma (Value system) and defend Desh (country) as their duty. There could be no compromise with this in any situation. Explaining that the concept of Dharma as envisaged by Indian thinkers was not just confined to religions or ways of worship. “We had in our country a number of religions. They were not in conformity with each other; even at times were opposed to each other. But they all had the same definition of Dharma because it was related to holding the society together. 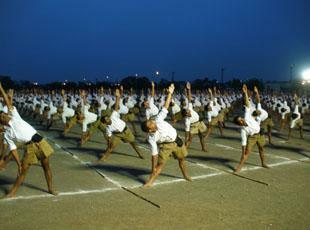 Today there is a need to introduce this ‘Samajdharma’ in educational curricula so that the eternal values that held the society together could be re-established”, the RSS Chief said. This Dharma which was known as ‘Sanatan Dharma’ or ‘Hindu Dharma’ was the essence of our society. We must plan our behavior and life in accordance with this Dharma. 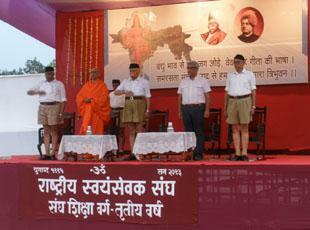 We must protect it at any cost, Dr Bhagwat appealed fervently to the swayamsevaks and masses. Curb Naxalism with firm hand: Firmly rejecting the idea of negotiating with the Naxalites, Dr Bhagwat called for curbing the Maoist violence with a firm hand and strong determination. Referring to the recent attack on Congress leaders in Chhattisgarh the RSS Chief said that these Naxalites talk of protecting the rights of the tribal people. But they believe in the principle ‘power flows through the barrel of the gun’ and indulge in indiscriminate and insensitive killing. They do not believe in our constitution neither do they honor the law of the land, then why talk with them?, he asked. They should be paid in the same coin, he added. The RSS Chief said that the Naxalites are more interested in creating chaos in the country than ameliorating their condition. “But the leaders and administration overlooked this fact and honor the traitors while the patriots are being punished. The government has failed in evolving an effective intelligence network, providing latest weapons to the security forces, and giving corruption-free administration. Instead of doing this the government and some leaders advocate for talking to Naxalites. This is very strange. Those who do not accept the Constitution and believe in violence cannot be allowed to hold the nation and society to ransom. There is no point in holding talks with them. They are the enemies of our country; they should be wiped out by using force. But our governments are incapable of doing it”, Dr Bhagwat asserted. Chinese incursions: Referring to recent Chinese incursions in Indian Territory the RSS Chief said that our reaction to this incident was similar to that of 1962. “Our leaders look at this ‘aggression’ as ‘localized affair’. Some of our leaders even say that our borders are not properly demarcated. They do not know that by saying this they are helping the enemy of the nation. This is ridiculous”, he said. This has once again proved how weak our government was in tackling serious situations like this, he said, adding that the manner in which this border issue was allowed to precipitate as also soft stance adopted by some leaders, presented a grim picture of the neglect of our country’s vital interests. Dr Bhagwat said that it was surprising to see that we have people amongst us who lobby for the enemy. This was a new phenomenon that we have people who speak on behalf of the enemy in our midst. This was a strange happening. In Assam, the border is not secure. Millions of foreigners have entered into our territory and despite the Supreme Court and High Court directives to detect and deport them no action was taken in all these years. No procedure was ever evolved to detect and deport these illegal foreigners, he said. Stating that the government was not vigilant about the security of our borders the RSS Chief said that the main function of the rulers was to protect the boundaries of the nation and to safeguard the value system that sustained the society. There could be no compromise with this. Today, the aim of politics was confined to fulfilling one’s interests and for this the parties and leaders could go to any extent even prostrating before the anti-nationals, appeasing the minorities and spreading confusion amongst the people just to get the required votes so that they could remain glued to power. Repeal of anti-cow slaughter law: Citing example of Karnataka government headed by Congress party Dr Bhagwat said that the first thing the new Congress government did was to remove ban on cow slaughter in the state. He questioned the propriety, priority, reasoning and logic behind repealing the anti-cow slaughter law passed by the earlier BJP government in the state. Just to appease the minorities this was done on priority basis, he said adding that by doing this the Karnataka government heaped insults and injuries to the feelings of millions of Hindus in the state and the country. He said that in democracy people are the supreme. They elect their leaders and governments. Given the provisions of the law and the system, people were bound to perform this duty. But they should realize that they hold the key to power and also a key to restore the system. No government or administration could work against the popular sentiments and wishes. That is why the fate of the country remained in the hands of the common people. They should rise above the petty differences of caste, language, religion etc. and stand as a strong, powerful and prosperous society to make the country the world leader. To make the society realize its duty, it was necessary to instill their faith once again in Dharma that is the eternal value system that sustained the society. Unfortunately, the word Dharma was wrongly translated as Religion confusing the minds of the common people. 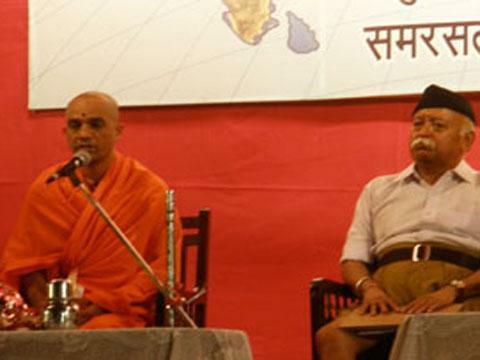 Recalling Swami Vivekananda’s observation that India was land of Dharma and no power on this earth could destroy it so long as it adhered to Dharma, the RSS Chief said that the RSS has engaged itself to restore people’s faith in this Dharma and awaken them to their duties towards the society and the nation. 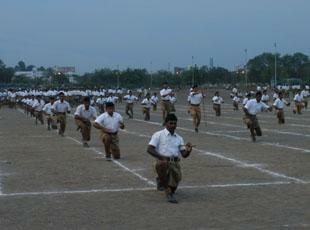 He appealed to the people to join the RSS in this noble mission. Sri Sri Sri Nirmalanand Mahaswami ji in his speech said that India was a young country with 70 per cent population belonging to the youthful people. This immense energy of youth should be diverted towards the positive direction so that it could be harnessed properly for the development of the society, he added. The youth should be introduced to the legacy of our culture and Dharma so that their gigantic energy could be properly utilized, he said. Lamenting that today’s youth was more westernized due to modern education system the head seer of Chunchungiri Mutt said that we should not forget our culture and moral values. Society sans values and culture could not make progress, he added. Stressing the introduction of values and principles of Dharma in the education system the swami said that the education system should redeem us from all bindings and separateness. Spiritual and ethical values alone can provide solution to our problems. 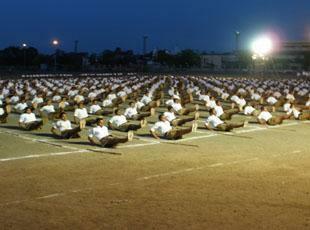 Earlier, the participants of the camp presented physical drills, exercises, suryanamaskars, and band performances. Sarvadhikari of Varg Sri Pawan Jindal made introductory remarks while Karyawah Vitthal Kamble introduced the guests and proposed vote of thanks. The function was attended by people from all walks of social life in large numbers.